The city of Oaxaca earns its position on many a travel itinerary because it's close to the ruin of Monte Alban, one of the most impressive ruin sites in Latin America, a vast ancient pre-Hispanic complex, built atop the highest mountains in the area. The city itself is a UNESCO World Heritage Site and in terms of history and culture, it stands unrivalled in South America. But the city boasts more than archaic ruins: a vibrant place teeming with wildlife, art, good food and beautiful churches, it makes for the perfect family holiday destination. The best places to stay in Oaxaca will leave you truly enchanted. The colonial heart is peaceful and shady and, in March, jacarandas bloom green and pure in the lovely central square, which is constantly besieged by some festival, market or troop of street musicians. Oaxaca also has a number of excellent museums, including the one attached to the Templo de Santo Domingo - a church and former monastery - which boasts a fascinating collection of pre-Hispanic artefacts. Churches, in particular, abound in the city, many of which are ornate and elegant like the Cathedral, built in the 16th century and so complex, it was only completed 200 years after the first stone was laid. Walking around the city, you will find fantastic street art, much of which is political satire, smattered on the facades of downtown Bohemian bars and boutique designers. In many ways, Oaxaca is a birdwatcher's paradise. Home to 70% of Mexico's 700 species of bird, throughout the city and in the surrounding mountains you will spot manic and exotic birds the like of which you have never seen. If you venture out of the city and head towards the blue and green mountains above Hierve el Agua, you will encounter strange and beautiful wildlife and gushing waterfalls shimmering in the sunlight. You cannot talk about Oaxaca without talking about Monte Alban. The 1500 year-old ruins sit atop a mountain looming over the outskirts of the city, including pyramids and ancient palaces, inhabited by pre-Hispanic civilisations. There are also the intricately-carved mosaics of Mitla, arguably detailing the religious beliefs of the Zapotec people - Mitla, in Zapotec, means the Underworld. Check out the gorgeous street art that covers the facades of houses, warehouses and shops throughout the city. Hike through the mountains above Hierve el Agua and drink in the scenery of wildlife and waterfalls! Go birdwatching. Oaxaca boasts 70% of all of Mexico's 700 species of birds. Check out the fascinating pre-Hispanic artefacts in the Templo de Santo Domingo! Hike to the top of Monte Alban and explore the fascinating ruins. Marvel at the mosaics of Mitla! Oaxaca is not just a beautiful city: brimming with art, history and gorgeous natural scenery, the city makes for the ideal family holiday destination. Check out our collection of the best places to stay in Oaxaca to find out why! 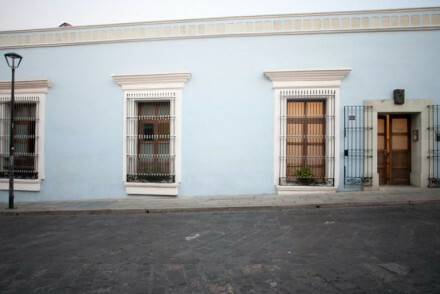 Las Bugambilias is a great value, family run B&B with plenty of traditional colour and charm. 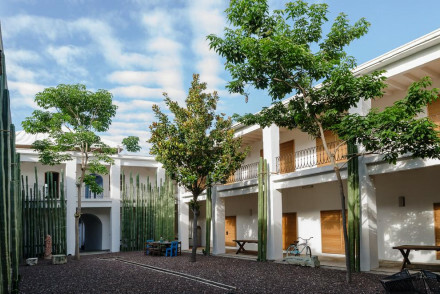 Its nine rooms allow you to stay right in the heart of old Oaxaca in comfort, and its restaurant serves classic Mexican dishes in a rustic, friendly setting. 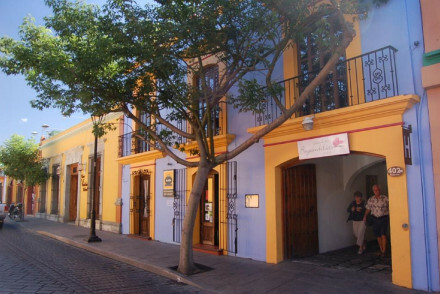 Casa Oaxaca is a seven room hotel converted from a charming colonial building, also in the centre of old Oaxaca. Rooms are arranged around a central courtyard and there's a roof terrace, pool and private gardens. This is a great option for foodies, as the chef, and manager, is happy to offer Mexican cooking workshops. Hotel Azul: ideally located for exploring the city's sights, the simply-styled courtyard-facing rooms are kitted with light wooden furniture and artworks. There is a classy terrace bar and a restaurant serving the best of Mexican fare. Perfect for families. Fly to Mexico City, then on to Oaxaca International Airport. Go between February and May, when there is little rain and the temperature ranges between 14 and 31 degrees. A characterful family-run bed and breakfast in arty Oaxaca. The three buildings are uniquely decorated with bright colours, Mexican art and plenty of charm. With large comfortable rooms and a rooftop terrace overlooking the city. Yummy communal breakfast adds to the family vibes. Value chic - Fantastic value for money from this characterful and charming spot, full of quirky Mexican art and family vibes. Eco break - Eco-tourism hotel, members of ConservAgua, a program that promotes the sustainable use of natural resources. Cooking classes - Chef Pilar Cabrera runs the nextdoor Casa de los Sabores Cooking School, learn to master Mexicos inventive and exciting cuisine. Sights nearby - Check out the famous Zapotec sites at nearby Monte Albán, Mitla and Yagul, the Cabreras will happily arrange tours. This Colonial manor turned boutique hotel is only five minutes from the action and offers a courtyard pool, a restaurant and bar. Cool comfortable rooms are adorned with local art. Enjoy the nouvelle Mexican cuisine surrounded by contemporary art works. A truly remarkable experience. Foodies - Chef Alejandro Ruíz has crafted two spectacular nouvelle Mexican cuisine restaurants around organic, fresh & local ingrediants. Local exploring - Oaxaca is famed as Mexicos artistic centre, learn more on one of the hotels tours of local artisan studios. Cooking classes - For a totally unique experience join the market tour and cooking class with one of Casa Oaxaca’s chefs- unbeatable! Sights nearby - Explore the beautiful cloisters of former monastery Santo Domingo de Guzmán. A historic building set around a picturesque courtyard. Bedrooms are simply styled with tiled floors, contemporary art and light wooden furniture. A chic terrace bar is the ideal place to enjoy an evening tipple and the restaurant serves up classic Mexican fare. The perfect base for city exploring. Local exploring - Well located as a jump off to exploring the city and its surrounds. Sights nearby - Visit the ancient capital of the Zapotecs, Monte Alban.